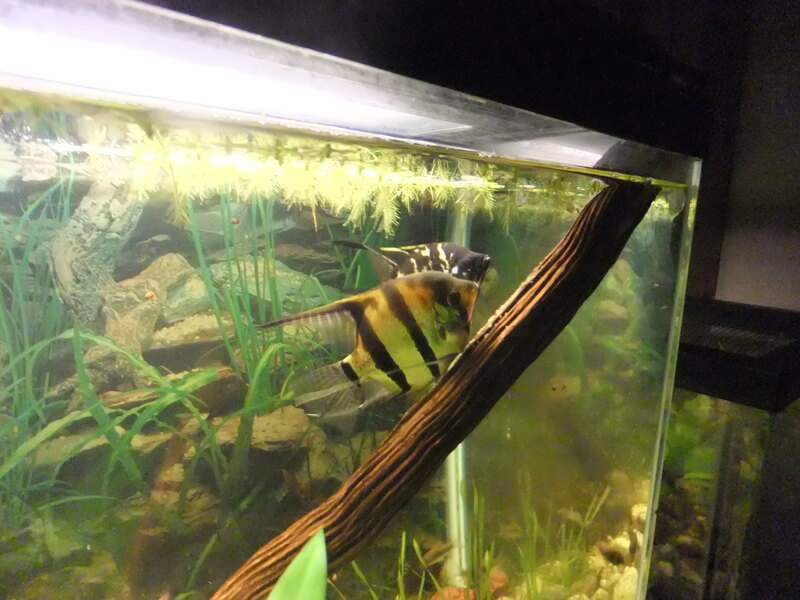 Some of my adult Angelfish have died recently. Two different tanks and different symptoms. It started over a month ago with my female Marble Angel. She was the mother of the 70 babies that are now living in various tanks here in Eastern Iowa. One day I noticed she looked lethargic, sitting near the bottom. It was puzzling. The next day she was dead! I suspect that she banged into the side or top of the aquarium and could not recover. An aquarium is a very foreign environment, even to a fish. Vertical glass walls with a plastic or glass top. One thing we can do to avoid this problem is to turn the lights on or off gradually. 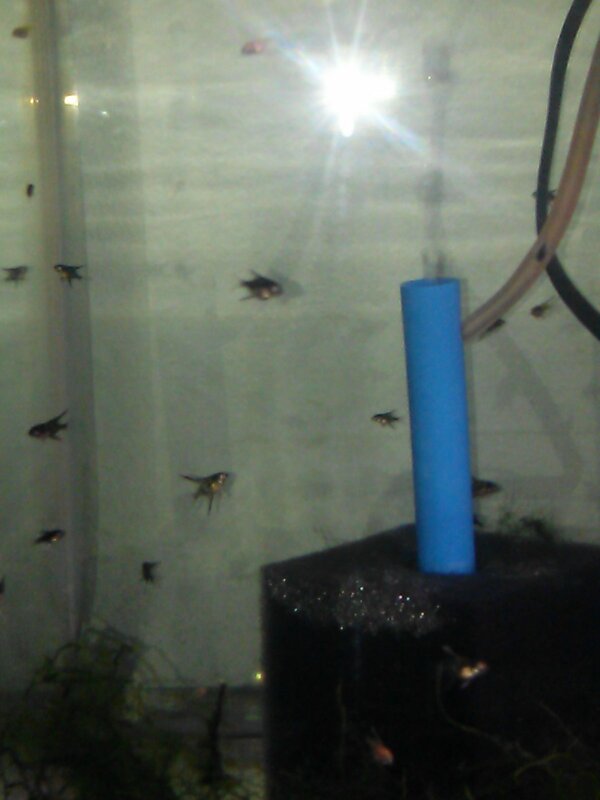 When I go into the fishroom I turn on an overhead room light. Then I turn on a light over some houseplants I have. Finally, I start turning on the tank lights. At night I do the reverse, of course. 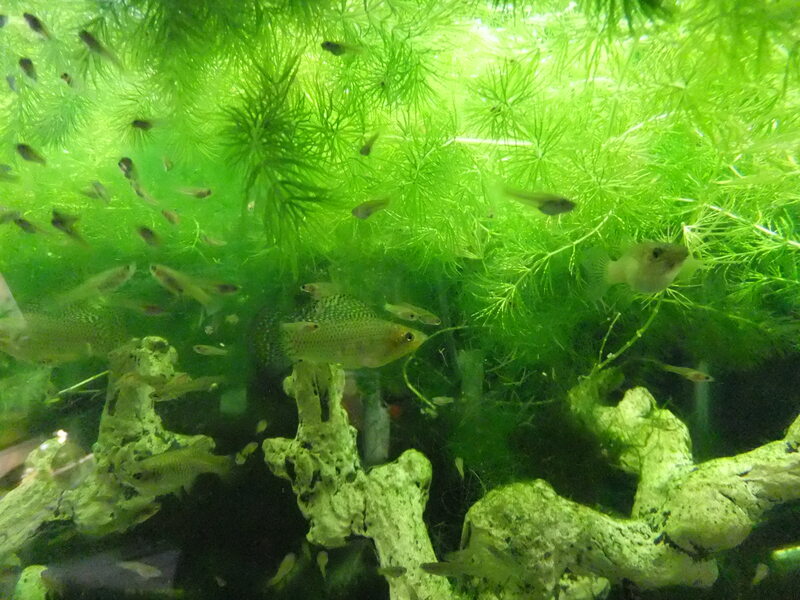 Fish lights off first, then the plants , then the room light. Then I lost this poor girl to Heximita, which I wrote about in a previous post. 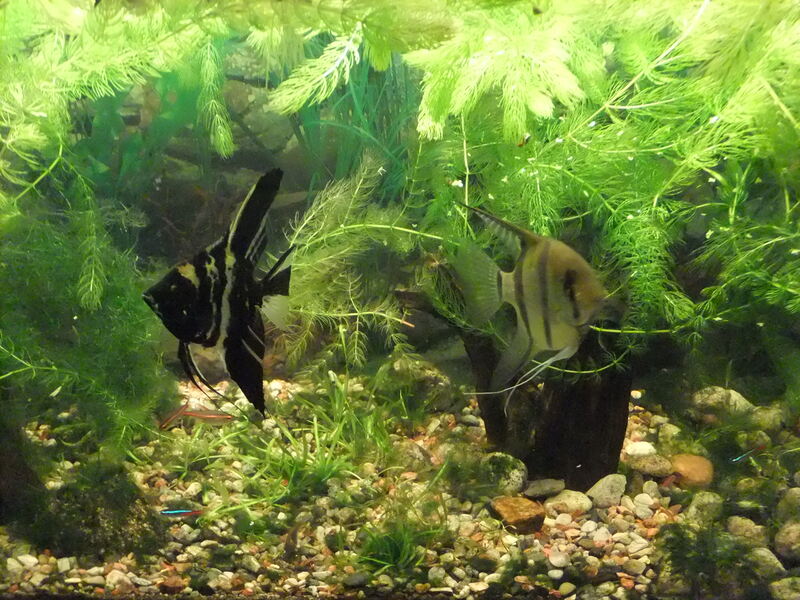 THEN, I was given 4 adult Angelfish! A neighbor gave me these fish. 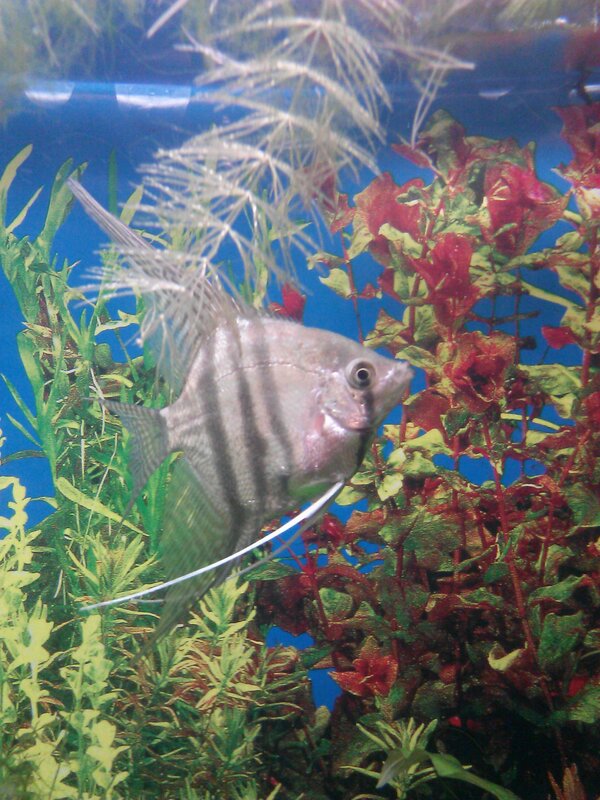 Originally, he bought 2 of my young Gold Angelfish, $1 each!. 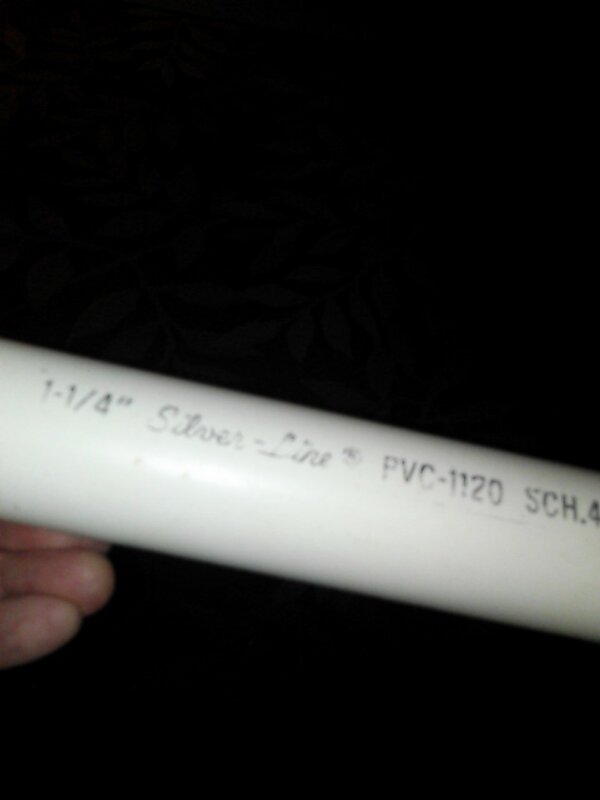 I didn’t know he lived two blocks away. 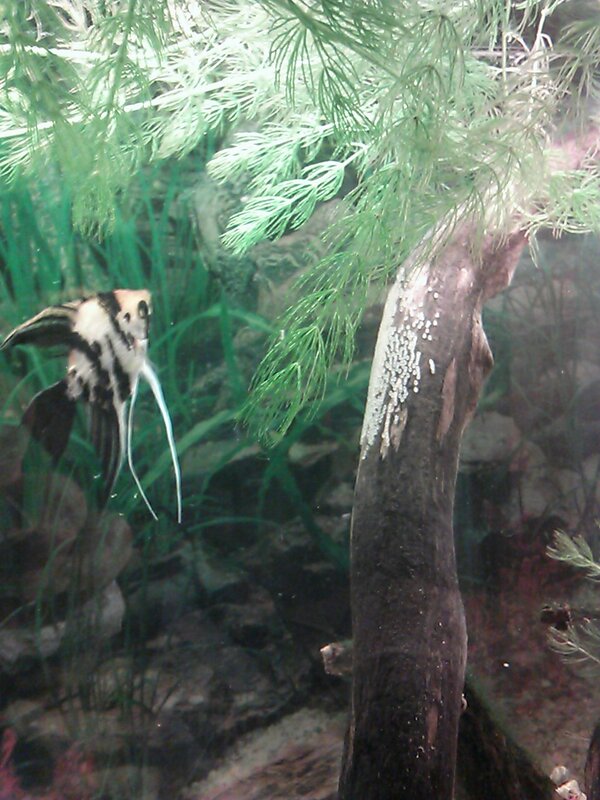 I gave him some plants, and later helped set up his Angelfish rearing tank, complete with brine shrimp, etc. 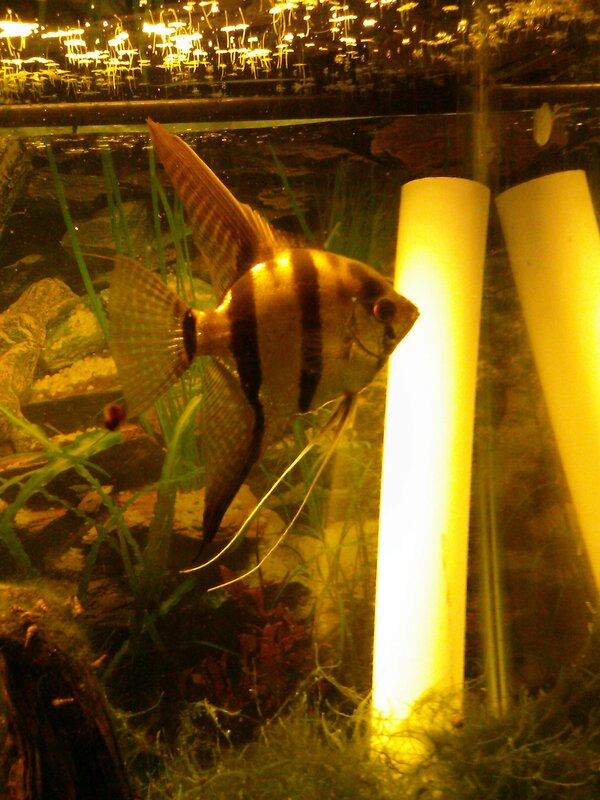 Then, he wanted some Jack Dempseys and …ta da!… I had Jack Dempseys to give him so… he gave me Angelfish. 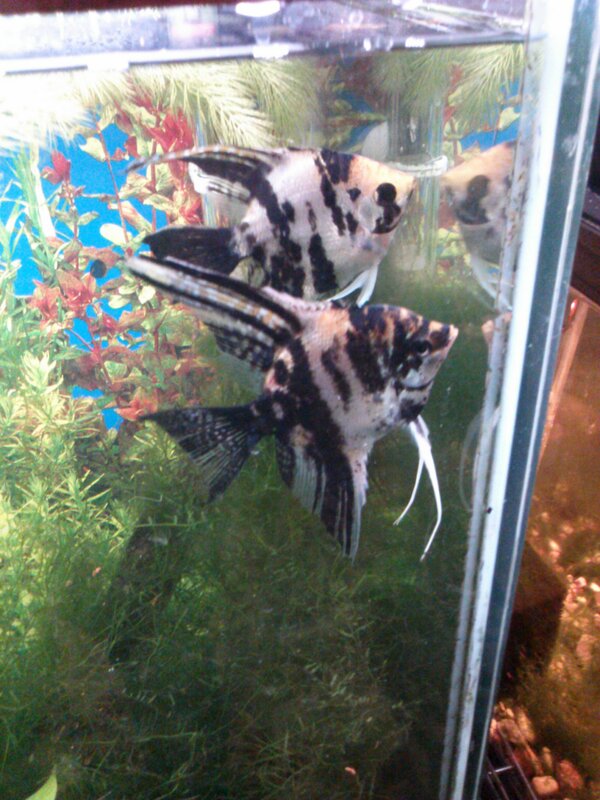 A breeding pair of Marble Koi Angels. …plus this Angel on the right. A week later this fish was dead. AND another adult that he gave me died!!! I didn’t have it long enough to get a photo of it. That one had ragged fins and a bloated belly and was no surprise but the one up above… well, it has just confused me. I guess the point is…some fish you can save. Some you can’t. Some diseases and injuries come on so fast there is no time to diagnose the problem. In those cases I think it’s a good idea to think about the general condition of the aquarium and make substantial water changes. You can test the water all you want but I still say, CHANGE the WATER!!! I’m talking like 20 percent every day for a week. After all, it’s called FRESH WATER right? Observe the fish awhile and see if any of the fish are being harassed by others. Try not to be discouraged when a fish dies. If you learn from it and stick with it you will find yourself raising fish by the hundreds! You can blame me when that happens. 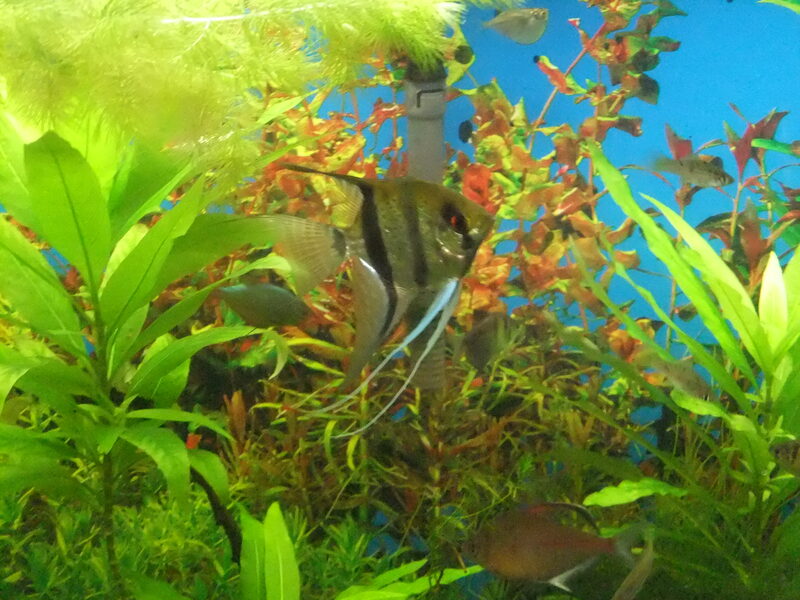 I kept a few of the Angelfish babies. 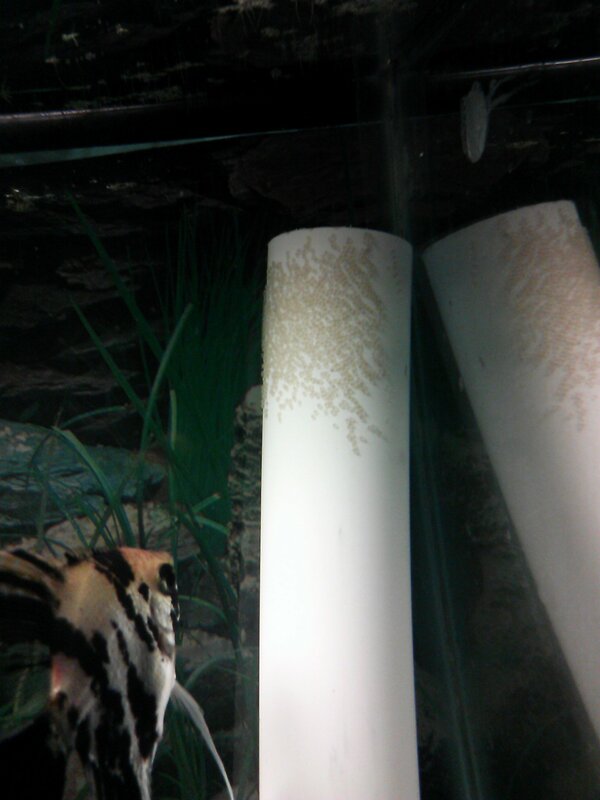 Most of the babies were Marbled. Some were Gold, and some were the wild Silver pattern. Only one of them had this Silver pattern of broken stripes. Is this how “Clown Angels” were discovered? 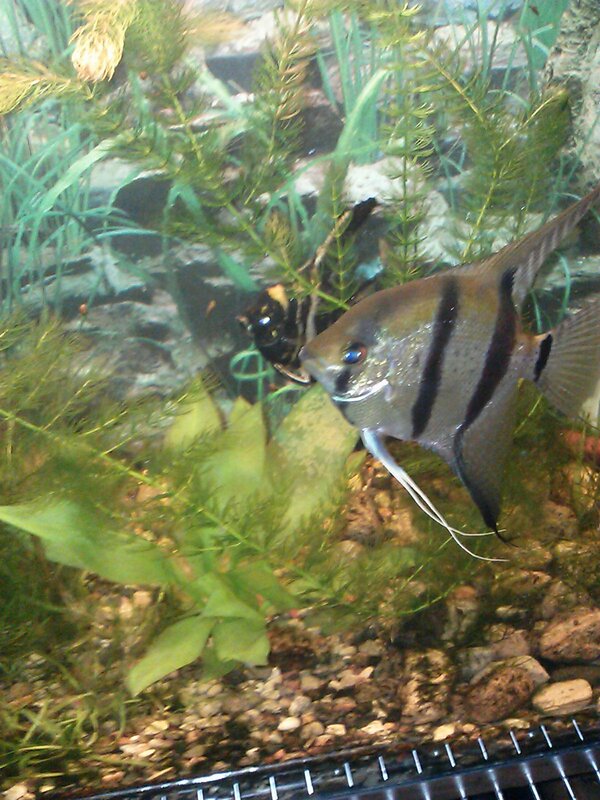 I also like the little dark one with the white ventral fins. 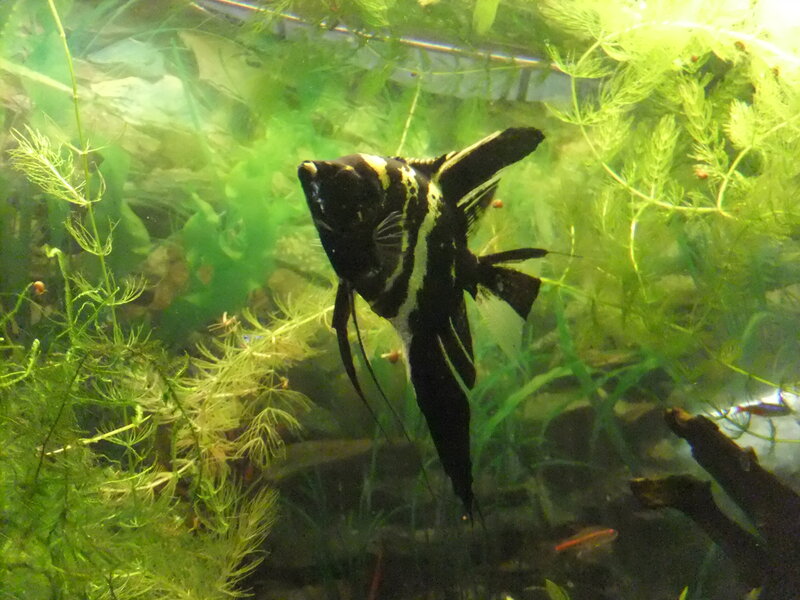 I kept this one because I thought the top fin, the dorsal, had an interesting pattern. 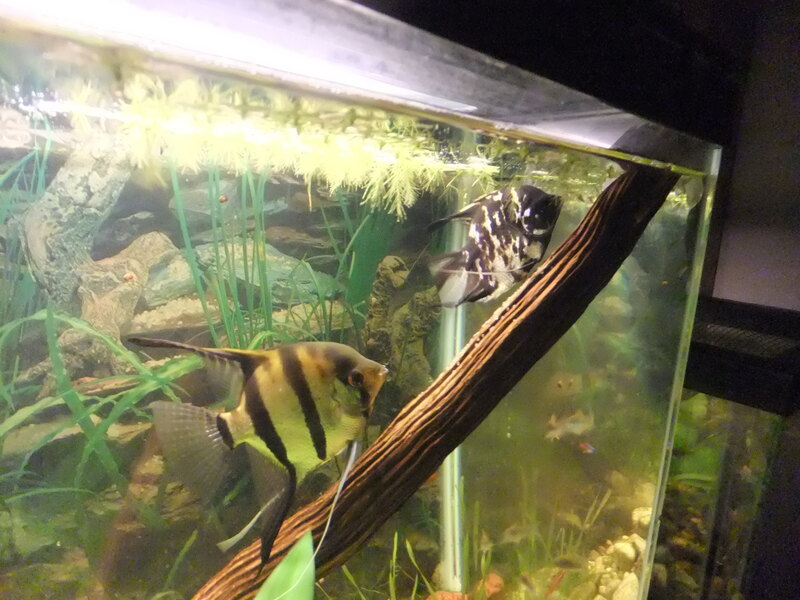 Here are two pics of the Angelfish parents. Their babies turned out to be many color combinations. All Silver like the dad, or Marble like the mom, or nearly black, or dark striped, or even all gold. The fact that some babies came out gold means that each of these parents carries the recessive gold gene. 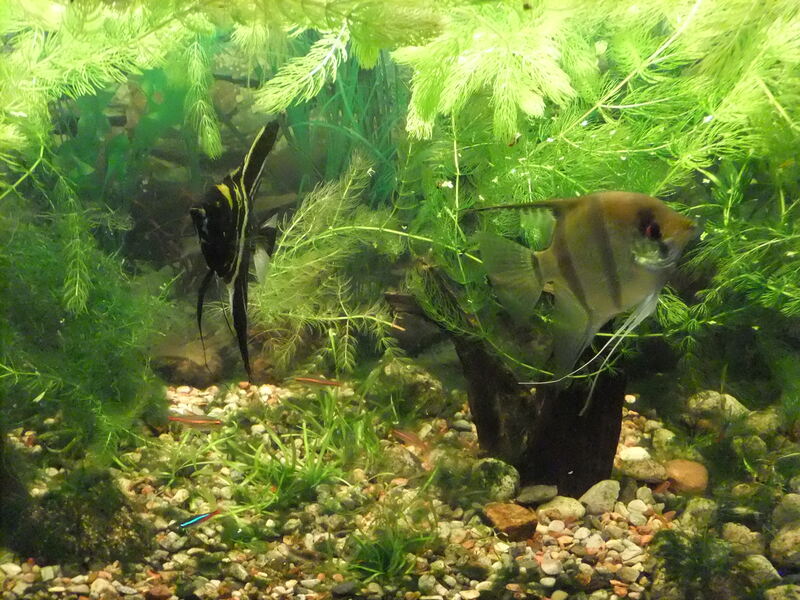 Over the past year my two pair of Angelfish have spawned dozens of times. They have laid thousands of eggs. A few months ago I gave some of those eggs to a friend to raise. I watched some of his techniques. He used Hydrogen Peroxide as a fungus inhibitor for the eggs. 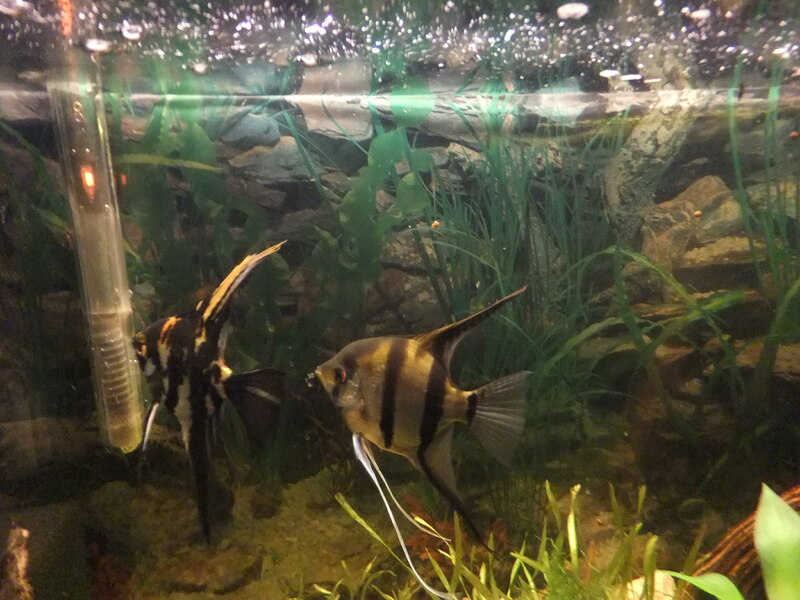 When he changes water in the fry tank he doesn’t use “fresh” water, he uses aged water from another one of his fish tanks. 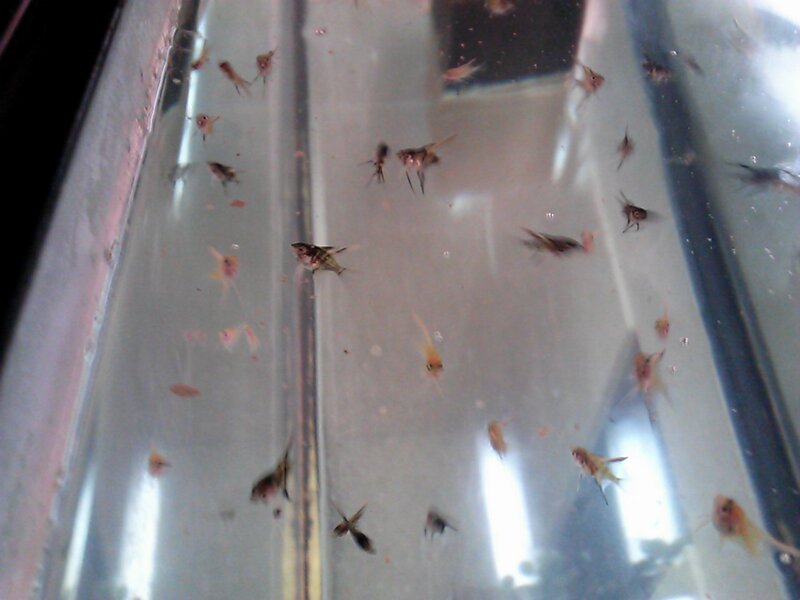 My MAIN problem was that I was was having no luck hatching Brine Shrimp, which is what the babies feed on. Turns out my shrimp eggs were old. Very old. Ancient. Fossil Brine Shrimp eggs. 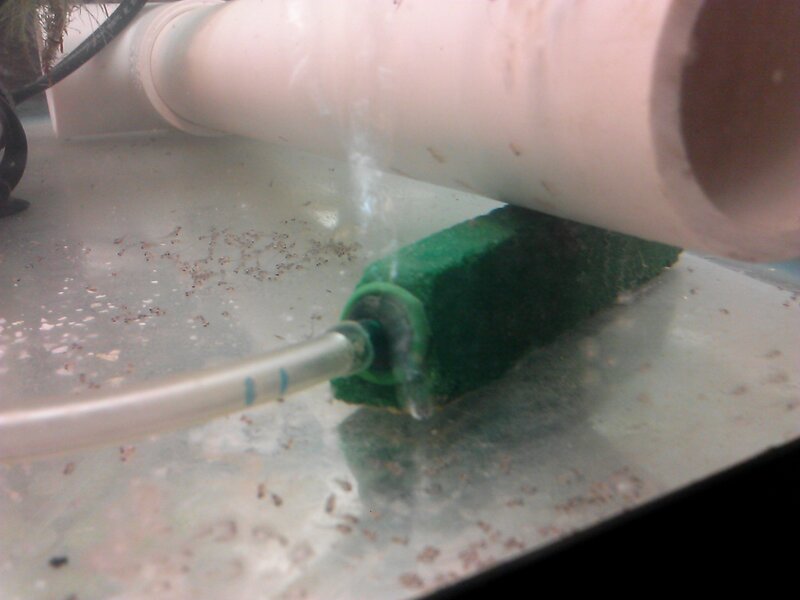 Once I got new shrimp eggs it was all easy after that. 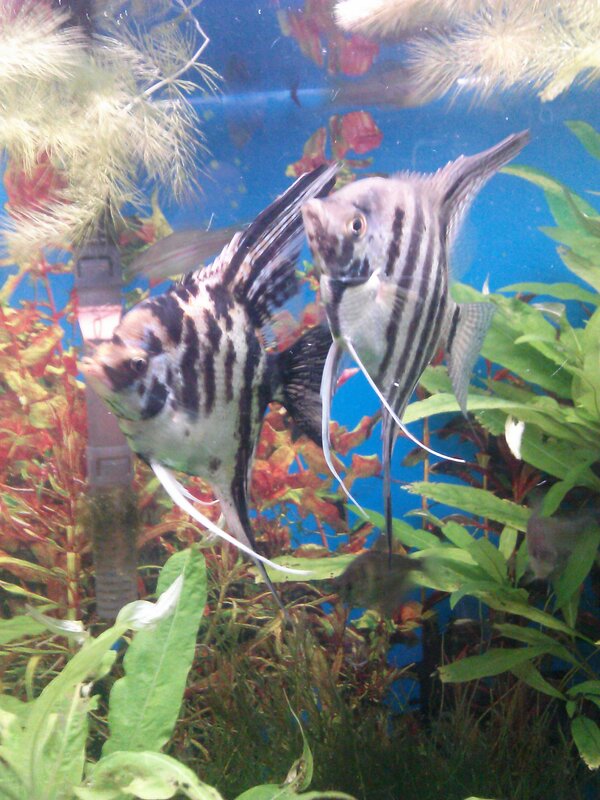 The male Silver and female Marble spawned on this fake Amazon Sword plant. 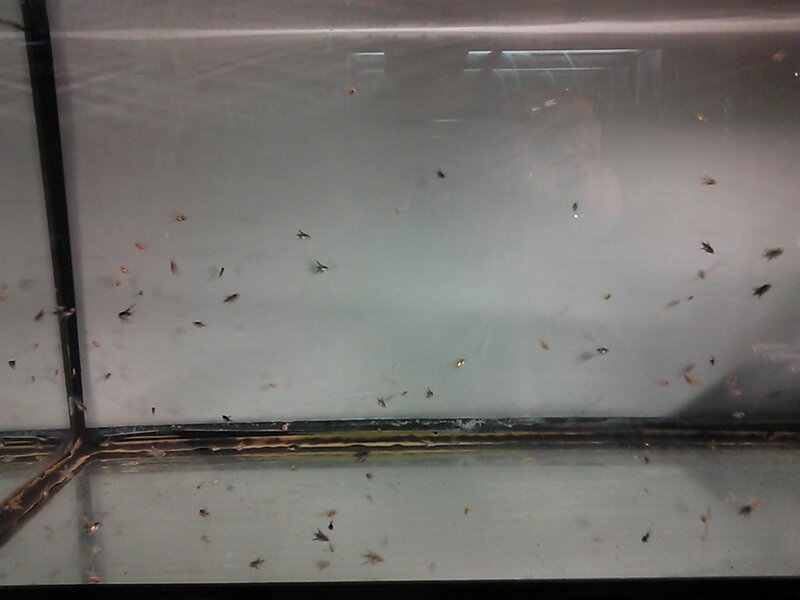 Baby Angels are in the 10 gallon tank. 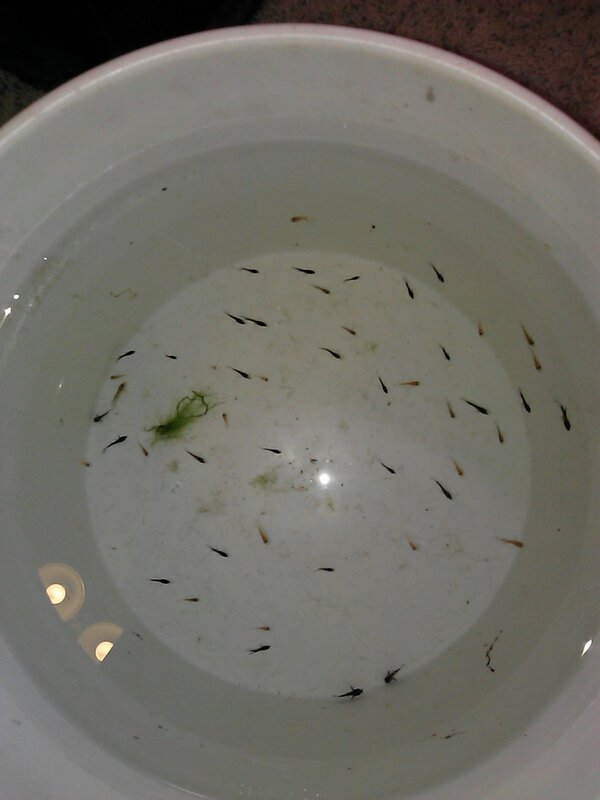 A bowl inside of the tank has another batch of Angel babies but shortly after becoming free-swimming they died. 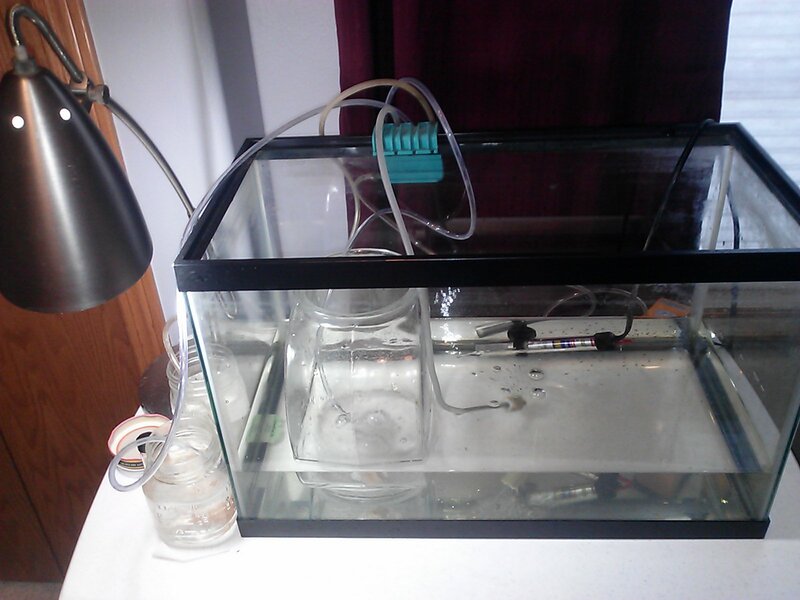 The two jars on the left is the Brine Shrimp hatchery. As the fry grew larger I filled up the 10 gallon. 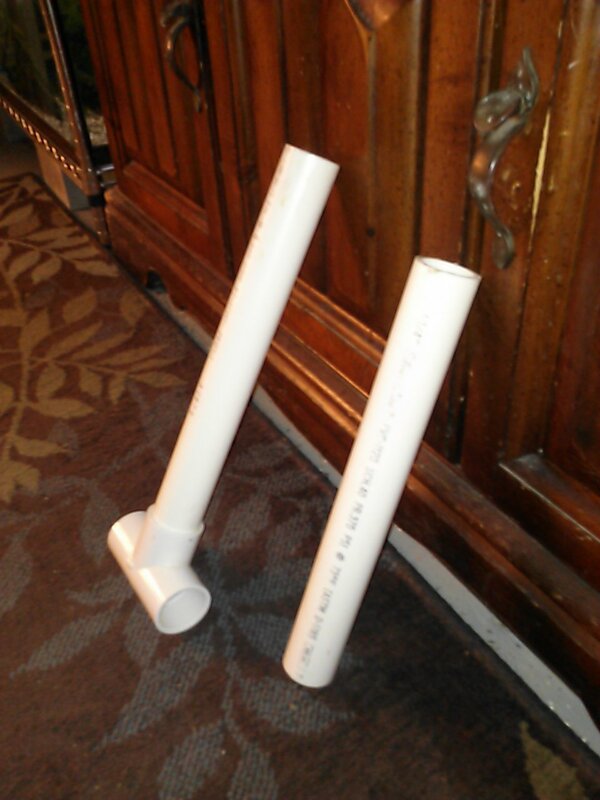 Eventually I split them into two 10-gallon tanks. There are about 90 babies total. 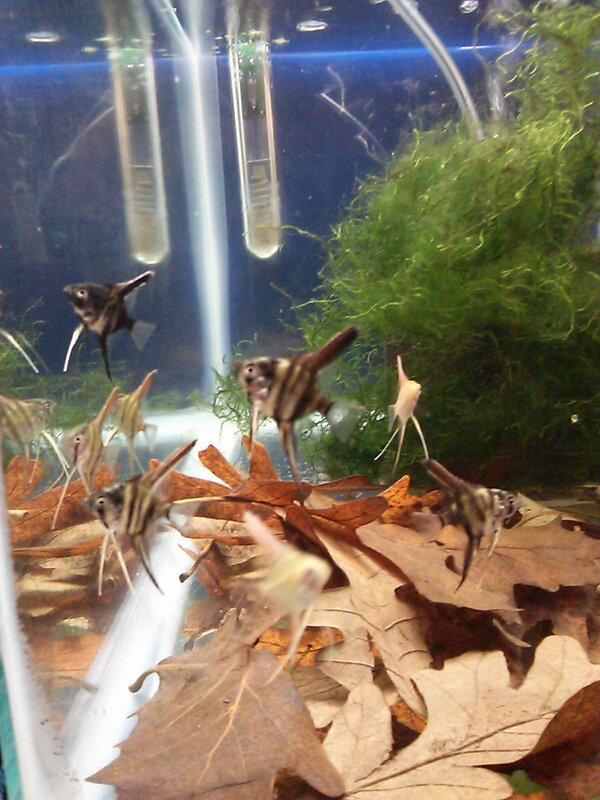 Here are half the baby Angels as I am moving them into a 55 gallon. 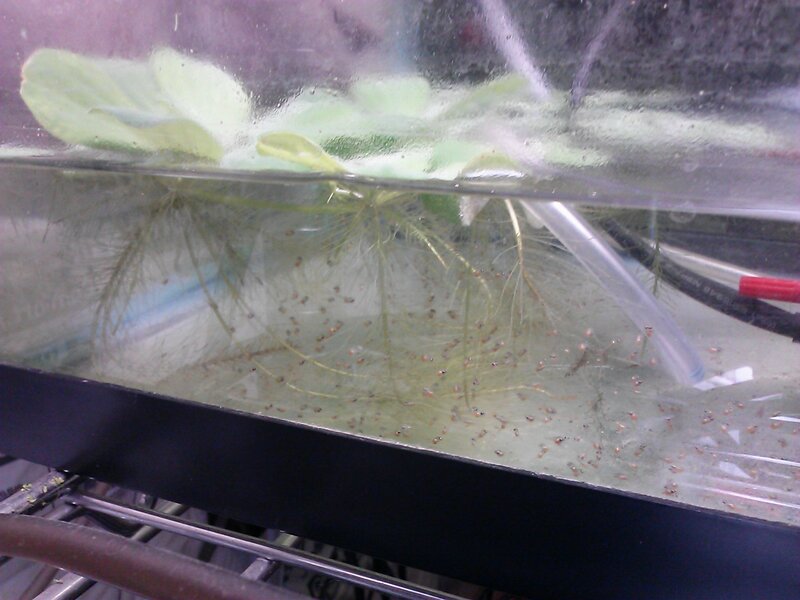 There are a few baby Peppered Corydoras in there, too. I’ve picked out eight young angels to keep for myself. 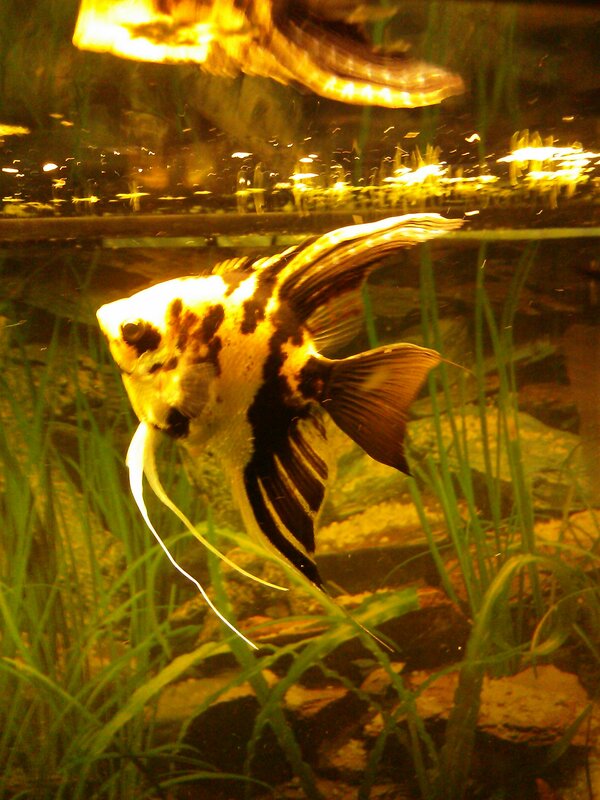 Notice there are gold genes in my fish, too. The babies are Silver, Marble, and Gold!! This morning I noticed the big Silver male was chasing the male Marble Angel.